Chinese tea is good for cleansing our digestive system. Often times, we’d like to have a cup of Chinese tea after a meal. Sometimes, I use Chinese tea for cooking. I got a can of Tieguanyin (鐵觀音茶) from a friend that is perfect to make some tea eggs, my long-time favourite snack. The marbled pattern on the egg white is very appealing to eyes. 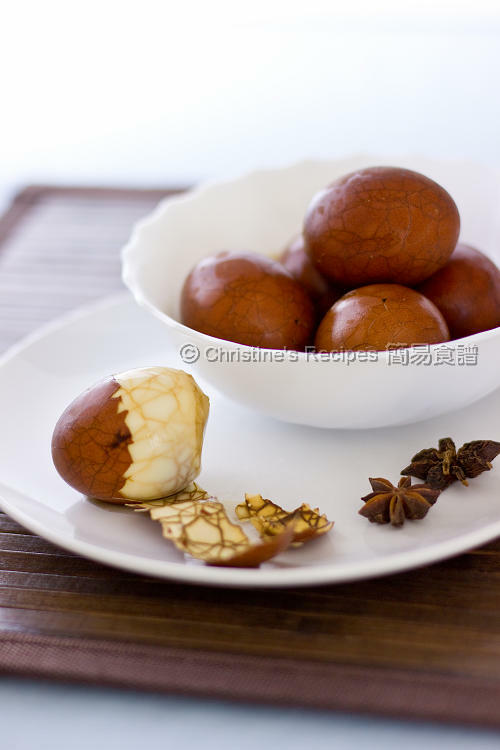 Chinese tea eggs, traditionally served during Chinese New Year celebrations, are easy to make. 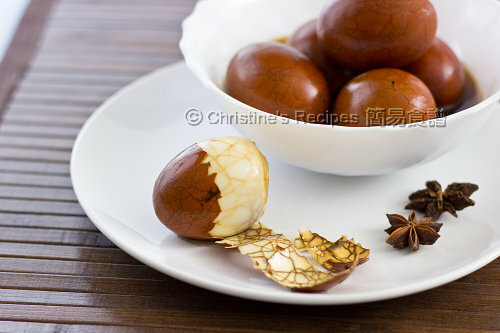 Simply prepare some boiled eggs and steep them in tea marinade. After a few hours, you can enjoy the flavourful and tasty eggs for tea time. To prepare boiled eggs: cover the eggs in a pot with water, about 2.5cm / 1 inch above the surface of the eggs. Turn on the stove heat to high and bring it to boil with a lid on. Reduce the heat to low and simmer for 1 minute. (Remark: Don’t use high heat because you don’t want your eggs crack in rigorously boiling water at this stage.) Remove from the heat with lid on. Use the residue heat to cook the egg for 10 minutes. Drain out the eggs. Immediately soak in cold water until cold to touch. Gently tap the egg shells with the back of a teaspoon and crack the shells. Use a needle to poke several times around each egg in order to help marinade penetrate inside. While waiting the boiled eggs to cool down, put the remaining ingredients and water in a pot and cook over medium-high heat. Carefully place the cracked eggs in the pot and bring it to a boil. Immediately reduce the heat to low and simmer for about 15 minutes. Remove the tea bags. Cover and continue to cook for another 5 minutes. Remove the pot from the heat with lid on. Let the eggs soak in the tea mixture for about 4 hours, or until the eggs take up enough flavour. You can take out one egg and taste to see if you’re satisfied. Before serving, gently reheat the eggs with the tea mixture. It’s better to soak the dried mandarin peel and remove the inner layer with a knife before cooking with other ingredients (see the above picture shown). The dark soy sauce is to help darken the egg shells. You might adjust the amount according to your liking. You might like to use any tea you like. Beware that every kind of tea has its unique flavour, colour and smell. 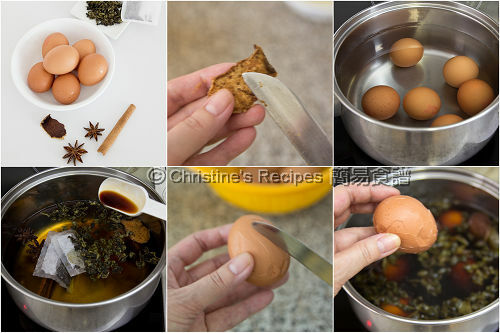 By soaking eggs in tea mixture, the eggs won’t turn too hard. If the weather is too hot, you might transfer the eggs with tea mixture in fridge with cover. When you need them, simply reheat the eggs with mixture before serving. The soaking time can be adjusted according to your personal preference. The eggs take time to soak up the flavours. Thus, by poking the eggs a few holes with a needle can help the marinade get through inside quickly. If you’re satisfied with the taste and saltiness of your eggs, drain them out, lest they will turn too salty. The leftovers can be kept in a container with cover for a few days in fridge. Oh, this is my favourite snack. Love the flavour after long braising in the spice tea. Beautiful! Such an interesting food. Do you serve them peeled or unpeeled? Are they eaten with the fingers, like a deviled egg, or are they eaten with a fork? I am thinking that they would be charming served in individual egg cups. I love the beautiful fragrance while the spiced tea is simmering on the stove. Hi do u know how to cook spaghetti cabnara hong kong style. What can I replace with mandarin peel if I don't have it? The mandarin peel is to add flavour. If you don't have, just skip it. The eggs are steeping as I type. Can I reserve the tea mixture for another batch in the future? You might reuse it for the next batch as long as you don't let it wait too long.